For citrus-lovers, lemon curd is a delicious treat, and avid readers might even remember the Lemon-meringue ice cream which I made some years ago. This time, however, we will stay clear of the cooked bases. This yoghurt-based recipe instead calls for the (preferably cold) ingredients to simply be mixed well together and then churned (If you have no ice cream machine, follow the general instructions here and still-freeze the frozen yoghurt in your freezer). Lemon curd is a fruit cream that differs from jam mainly in being more zesty and – thanks mainly to the inclusion of butter and egg – generally smoother. 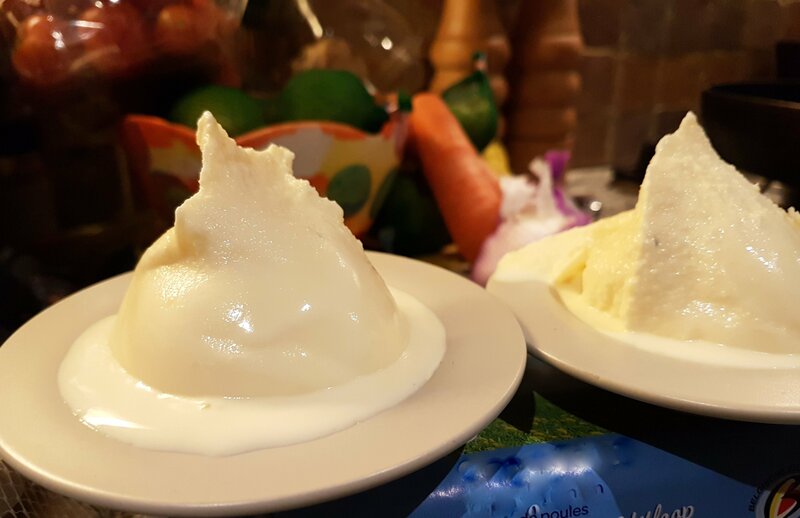 While I used a store-bought jar of curd, it is supposedly not very difficult to make (try this link – or the one above leading to the post on the lemon-meringue ice cream – and see for yourself:). A jar of Lemon Curd – a sumptuous treat for any lemon-lover, and a real classic in the Anglo-Saxon part of the world. In the background, a tub of dense, rich Greek yoghurt. 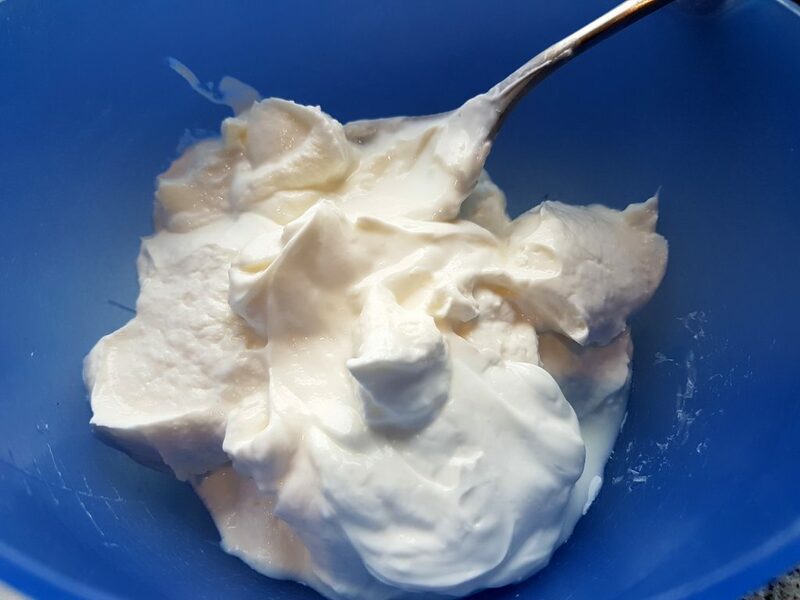 The base consists of fat, Greek-style yoghurt, with the addition of some cream cheese (the latter also responsible for most of the overall fat) in order to further improve smoothness and overall texture. 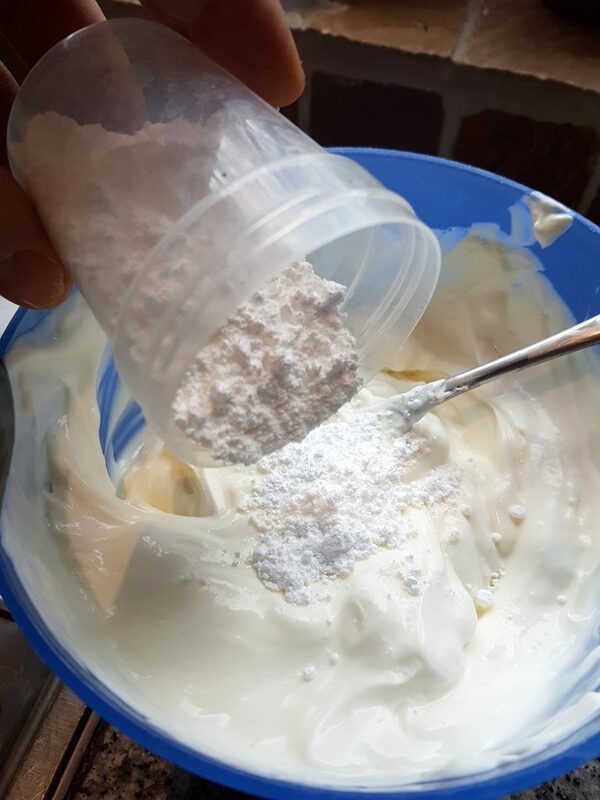 Since the lemon curd is sweet in itself, I only added a little confectioner’s sugar to the base: this powdered sugar will easily dissolve into the base even if all the other ingredients remain cold. That’s all! 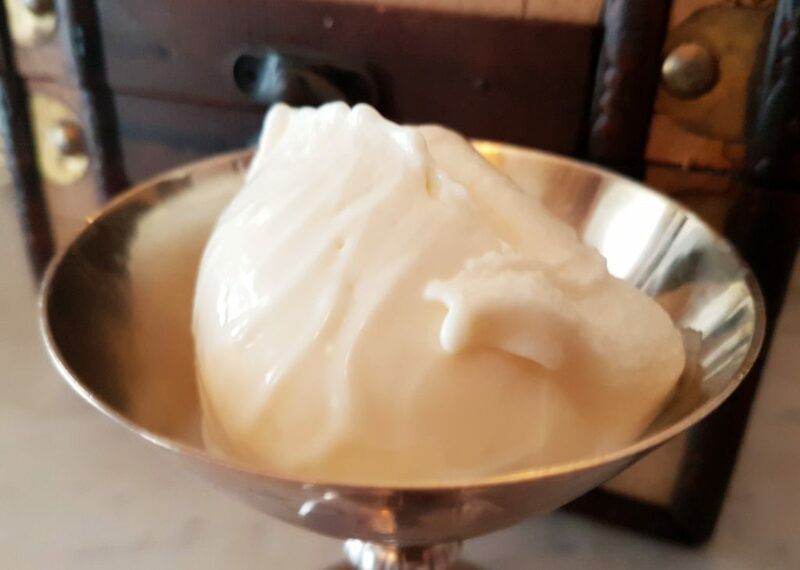 No, it could probably not be easier: just put all the ingredients (preferably cold) together, mix well and churn (If you like, you could also wait some before adding the lemon curd to the base, either adding it half-way through the churning, or even rippling it into the base afterwards). 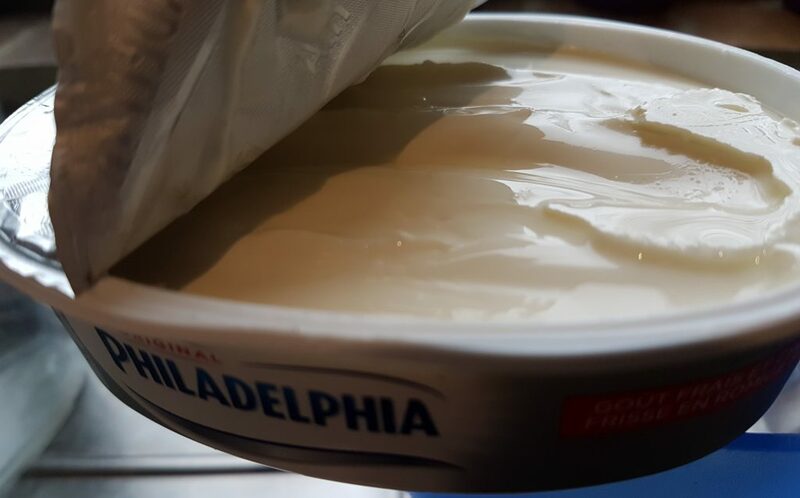 Soft cream cheese (here Philadelphia) makes for a good ice cream-base ingredient. Its discreet flavour ensures that the overall result won’t turn “cheesy”. Confectioner’s sugar – the main advantage of using this powdered sugar instead of the “ordinary” white variety is that it will smoothly dissolve into the base even in the absence of any added heating or protracted whisking. Once all the ingredients (possibly with the exception for the lemon curd) have been mixed together, it is time to churn the yoghurt ice cream. If you add also the lemon curd from the start, that’s it. Otherwise, you will have to add it once the base has firmed up a little during the churning. Or you could wait for the churning of the base to finish, and then ripple in the lemon curd last. The incredibly simple recipe might mislead you to think that the result also will be rather banal. Nothing could be more wrong. 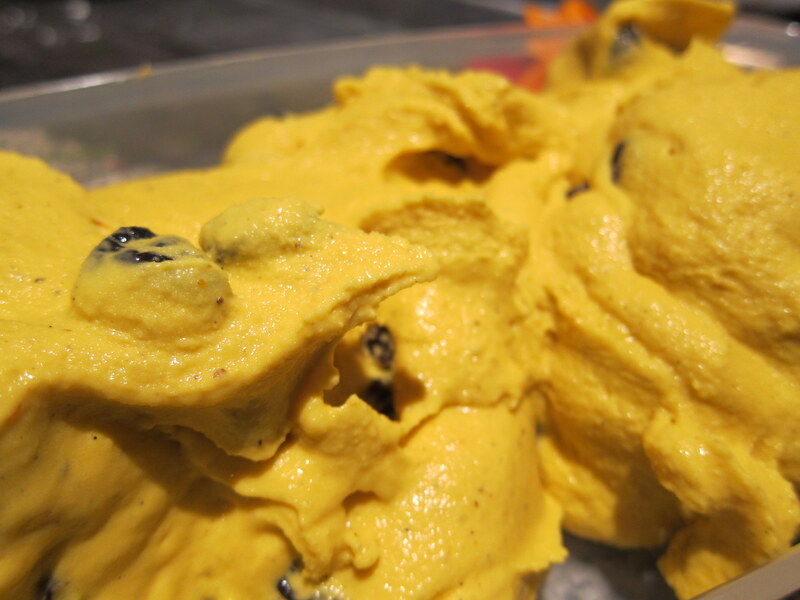 This is a truly sumptuous yoghurt ice cream, destined to please all lovers of zesty lemon. 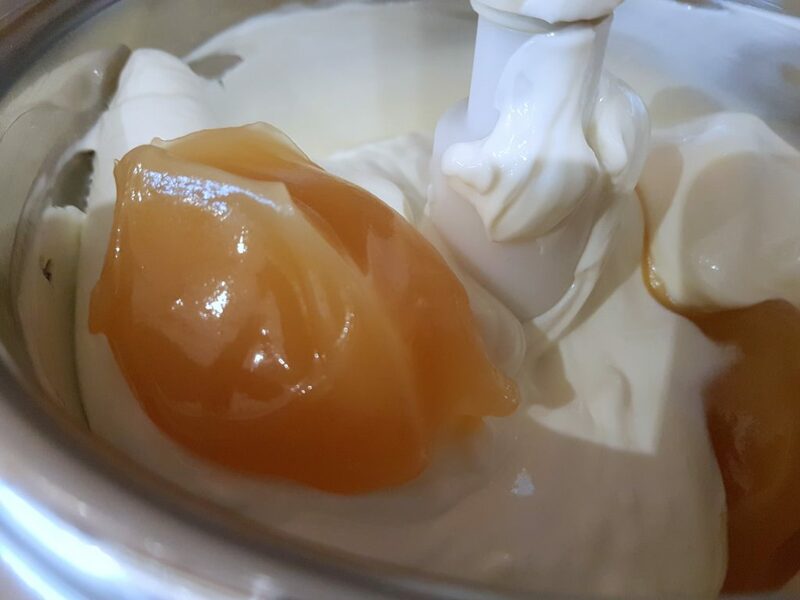 The sweet, zesty lemon flavour of the curd really comes across, in a rich and remarkably smooth overall experience. 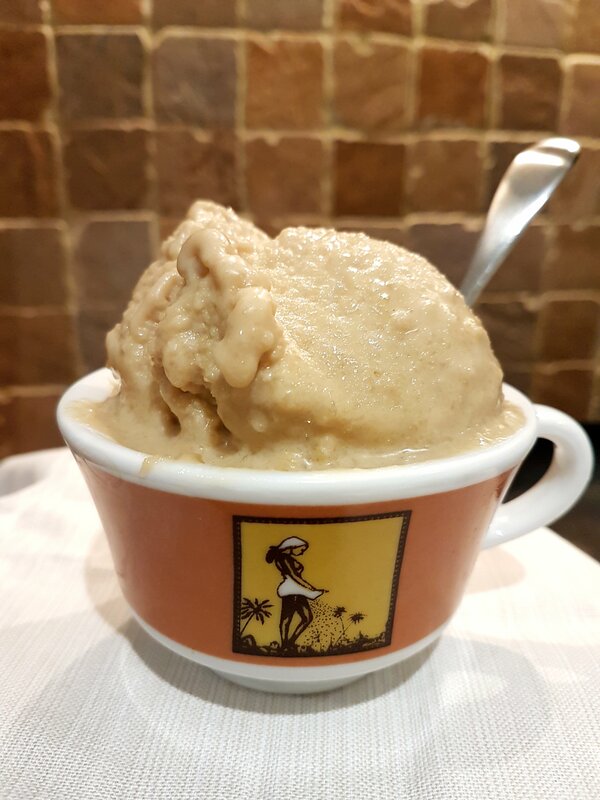 Despite the – relatively speaking – quite moderate overall amount of fat, the ice cream is not only smooth but also delightfully rich and dense: Thanks to the Greek yoghurt and to the cream cheese that make up most of the base. They also ensure that the overall amount of ‘free-floating’ water is limited. Which in turn serves to reduce the risk of unpleasantly large ice crystals forming during the churning. In fact, the seductively pleasant mouthfeel is significantly less cold (!) than in many other ice creams. The charming ice cream quickly won the hearts and taste buds of the household. While it stores reasonably well in the freezer, eating it fresh is clearly the supreme option. But worry not – even the small amount left in storage after the first testing was devoured with great enthusiasm the day after: just leave it out to thaw a little before serving … if you can control yourself that long, of course 😉 . 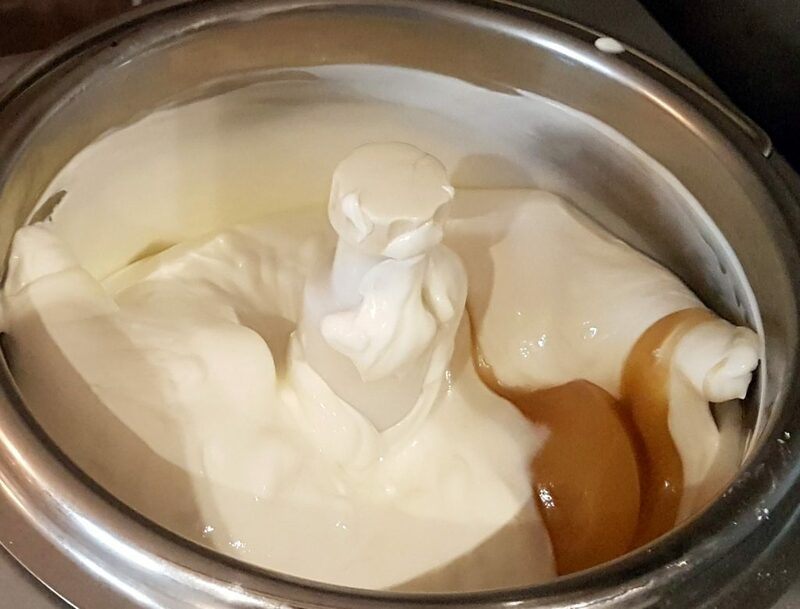 A rich, yet surprisingly moderate in fat, yoghurt ice cream guaranteed to please with its seductive density, smoothness and sweet lemon curd flavour. Mix everything together, except possibly for the lemon curd. Churn until about halfway finished, then add the lemon curd (if not already added). Enjoy right away, or store in a freezer-safe container (covering with plastic film and lid) for later. If you would like to try for a rippled ice cream, finish the base and - suggestively using a fork or a knife - add the lemon curd last: Ripple it in, and put in the freezer to finish. Please, please would you give alternative measures. In my country (UK) only liquids are measured in volume (ml) e.g milk, cream. Anything else is by weight (g ) e.g yoghurt, lemon curd, butter. Trying to measure lemon curd or butter in a measuring jug just makes a mess ? In this case, the differences between volume-quantites and weight are not that big. 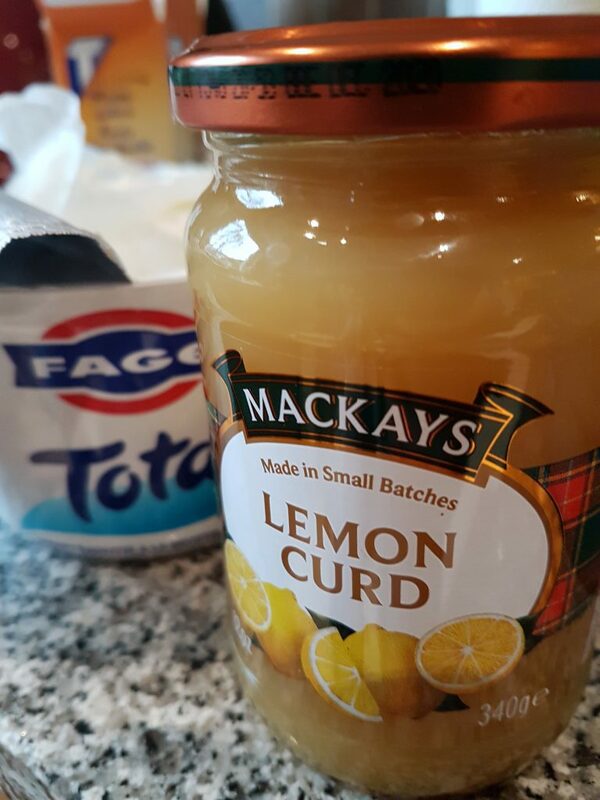 For the lemon curd, you could count with about 300 gram (most of the content of the jar I was using, incidentally), for the yoghurt about 480 gram or so (and indeed, don’t go overboard with the fat content of the yoghurt 🙂 ).